Den er ikke latterlig billig akkurat nå hvis en ser på pris vis a vis inntjening, etter min mening. Alunorte nedstengingen tærer på inntektene. Selv om de fikk godkjenning til å starte opp i morgen vil det ta tid før anlegget opererer på full kapasitet. Hver dag som går nå uten full kapasitetsutnyttelse vil sakte, men sikkert ødelegge 2019. Ser en på pris-bok forholdet er det derimot , etter min mening, en god deal. Om du tenker å holde Norsk Hydro i en 3-5 års periode tror jeg nå er sjansen å få den rabattert hvis du er tålmodig . Jeg har papiret selv, men jeg tror ikke det får en skikkelig boost før 2020. .In our first year as a fully integrated and truly global aluminium company, we showed encouraging progress in designing, developing and delivering aluminium products and solutions worldwide. But 2018 was also heavily affected by the production embargo at our alumina refinery Alunorte in Brazil., President and CEO Svein Richard Brandtzæg writes in his letter to shareholders. .2018 was the year our new business area Extruded Solutions was financially and operationally fully integrated in our now 36,000-strong Hydro family. It has added competence, assets and customers in key downstream segments across all continents, in line with our ambition to become a better, bigger and greener company., Brandtzæg says. .The Karmøy technology pilot has been ramped up to produce the world.s most climate and energy-efficient primary aluminium, we have decided to upgrade the Husnes plant, delivered better results from remelters, secured future renewable power sourcing, invested in selective downstream projects such as extrusion capacity for the US automotive market and improved performance at the new automotive line in Germany., Brandtzæg continues. .At the same time, 2018 stands out as the most demanding year for me as president and CEO of Hydro. We have learned from the Alunorte situation . both with regards to our operational activities inside the fence of Alunorte, as well as how local communities surrounding our operations regard us as a neighbor. Through dialog with our local communities, we realize that we had not lived up to their expectations or our own ambitions. Hydro can only succeed as a company if the societies around us are viable., Brandtzæg says. .The curtailment at Alunorte has weakened our financial results and progress of our improvement program. In addition, different tariffs and sanctions have influenced global markets and trade flows over the past year, also affecting our industry. But as the metal of the future continues to find its way into new applications, demand growth remains firm and future prospects look promising. More and more of our aluminium is used automotive applications, light-weighting transportation and reducing carbon emissions in the user phase., Brandtzæg says. .Being engaged in the entire aluminium value chain provides advantages that are unmatched by our global peers. By tracking each step along the way, we are able to document and be transparent about our sustainability practices. As part of taking responsibility, and to contribute to sustainable development, we have taken part in developing the standards of the Aluminium Stewardship Initiative. The first Hydro plants have already received certification, and we are on track with our plan to achieve certification along the entire aluminium value chain from mine to recycling in the coming months., Brandtzæg says. .If the global climate challenge is our biggest challenge, technological advancement is our greatest opportunity. We are pushing the laws of nature to achieve more energy-efficient electrolysis. We utilize digitalization, big data and artificial intelligence to optimize and automate processes. We tailor-make specific aluminium properties on the atomic level to innovate new products and solutions that reduces emissions in the user phase., Brandtzæg says. .In short, by bringing to life the unique qualities of aluminium, we address both the greatest threat and opportunity of our time., Brandtzæg ends. The audited and Board of Directors. approved financial statements for 2018 have been changed from the Q4 results published on February 7, 2019. A charge of NOK 157 million has been included related to Hydro Extrusion Portland, Inc (formerly Sapa Profiles, Inc, (SPI)), Hydro Extrusion USA, LLC and the United States Department of Justice reaching an agreement in principle on investigations regarding aluminum extrusions that SPI manufactured from 1996 to 2015. Hydro.s reported net income for 2018 following the adjustment is NOK 4 323 million and reported EPS is 2.08. The report, meeting the Norwegian statutory requirements for annual reporting, is “Financial Statements and Board of Directors’ Report - 2018.” This report is available in Norwegian and English. In addition, a more extensive report is available, “Annual Report - 2018,” with detailed information about Hydro’s businesses, operational performance, financial performance, viability performance, corporate governance, environmental, social and financial statements. The report is available in English. Content from the two reports can be found at www.hydro.com/reporting2018. All parts of the reports can be downloaded from this web site and printed in PDF format on demand. Certain statements included in this announcement contain forward-looking information, including, without limitation, information relating to (a) forecasts, projections and estimates, (b) statements of Hydro management concerning plans, objectives and strategies, such as planned expansions, investments, ivestments, curtailments or other projects, © targeted production volumes and costs, capacities or rates, start-up costs, cost reductions and profit objectives, (d) various expectations about future developments in Hydro’s markets, particularly prices, supply and demand and competition, (e) results of operations, (f) margins, (g) growth rates, (h) risk management, and (i) qualified statements such as “expected”, “scheduled”, “targeted”, “planned”, “proposed”, “intended” or similar. Although we believe that the expectations reflected in such forward-looking statements are reasonable, these forward-looking statements are based on a number of assumptions and forecasts that, by their nature, involve risk and uncertainty. Various factors could cause our actual results to differ materially from those projected in a forward-looking statement or affect the extent to which a particular projection is realized. Factors that could cause these differences include, but are not limited to: our continued ability to reposition and restructure our upstream and downstream businesses; changes in availability and cost of energy and raw materials; global supply and demand for aluminium and aluminium products; world economic growth, including rates of inflation and industrial production; changes in the relative value of currencies and the value of commodity contracts; trends in Hydro’s key markets and competition; and legislative, regulatory and political factors. Hilde Merete Aasheim has been appointed new President and CEO of Norwegian aluminium company Norsk Hydro ASA. Aasheim succeeds Svein Richard Brandtzæg, who has decided to step down after 10 years. The appointment will be effective May 8, 2019. .I am pleased to announce that Hilde Merete Aasheim has accepted the job as President and CEO of Hydro. Based on her unique combination of broad industrial experience, commercial instinct and strong leadership skills, Aasheim is the perfect fit as Hydro.s new CEO,. says Dag Mejdell, chairperson of Hydro.s Board of Directors. .With more than 30 years of experience from Norwegian and global industry and an impressive track record of industry-leading improvement and change processes, Hilde has what it takes to further strengthen Hydro.s position as a world-leading aluminium company,. says Mejdell. Aasheim is currently executive vice president and head of Hydro.s Primary Metal business area, a position she has held since 2008. She has worked within industry since the start of her career, including in Elkem, Statoil and Hydro, where she has spent 12 years altogether. She has previously chaired the global industry association International Aluminium Institute and the Federation of Norwegian Industries and been board member of construction and civil engineering company Veidekke and fertilizer group Yara. Svein Richard Brandtzæg, who became the CEO of Hydro in March 2009, has decided to step down after 10 years as CEO. Brandtzæg has been working in Hydro for 33 years and will remain with the company until the end of 2019. He will act as an advisor to the new CEO and Hydro.s technology board. .Svein Richard Brandtzæg has transformed Hydro into a world-leading aluminium company, with strong positions along the entire value chain of aluminium and 35,000 employees in 40 countries. This includes the key strategic decisions of acquiring bauxite and alumina assets in Brazil in 2011 and global aluminium extrusion champion Sapa in 2017, completing Hydro.s aluminium value chain. Brandtzæg is a true aluminium enthusiast and technology optimist, which is evident in his leadership and legacy in Hydro,. Mejdell says. Hydro became victim of an extensive cyber-attack in the early hours of Tuesday (CET), impacting operations in several of the company.s business areas. Tror at det er mer eller mindre standard prosedyre etter 9/11 angrepene. Har man hendelsen fra Mærsk friskt i minne så vet man at dette kan bli svært kostbart å ordne opp i. Nå kommer det info om at det er snakk om ransomware og agrep på AD servere. Som kommunisert tidligere i dag, 19. mars, har Hydro vært utsatt for et omfattende cyberangrep, som påvirker driften i flere av selskapets forretningsområder. Hydro har isolert alle anlegg og operasjoner og skifter til manuell drift og prosedyrer så langt som mulig. Hydros hovedprioritet er å fortsette sikker drift og begrense operasjonelle og økonomiske konsekvenser. Situasjonen har ikke ført til noen sikkerhetsrelaterte hendelser. Hydro arbeider med å nøytralisere angrepet, men kjenner hittil ikke det fulle omfanget av situasjonen. Det er for tidlig å indikere operasjonelle og økonomiske konsekvenser, samt tidsaspekt for å løse situasjonen. Hydro gjør sitt ytterste for å begrense påvirkning på kundene. Hydro has made progress in securing safe and stable operations across the company, following an extensive cyber attack that hit on Tuesday. Hydro.s technical team, with external support, has succeeded in detecting the root cause of the problems and is currently working to validate the plan and process to restart the company.s IT systems in a safe and sound manner. However, it is still not clear how long it might take restore stable IT operations. As communicated on Tuesday, Hydro was subject to an extensive cyber-attack, impacting operations in several of the company.s business areas. Following detection of the problem, Hydro isolated all plants and operations and switched to manual operations and procedures. The main priority continues to be to ensure safe operations and limit operational and financial impact. .I.m pleased to see that we are making progress, and I.m impressed to see how colleagues worldwide are working around the clock with dedication to resolve this demanding situation and ensure safe and sound operations,. says Hydro.s CFO Eivind Kallevik. .I would also like to complement our external technical partners who have done an important job in supporting our efforts, and also relevant authorities, who handle the issue with the diligence it deserves,. Kallevik says. Most operations are running, ensuring deliveries to customers according to specifications, with some more manual operations than normal. Extruded Solutions: Lack of ability to connect to the production systems have caused production challenges and temporary stoppage at several plants. Progress has been made, with the expectation to restart certain systems during Wednesday, which would allow for continued deliveries to customers. Rolled Products: Lack of ability to connect to the production systems have caused limited operational impact. Progress has been made, with the expectation to restart certain systems during Wednesday, which would allow for continued deliveries to customers. Hydro still does not have the full overview of the timeline towards normal operations, and it is still to early to estimate the exact operational and financial impact. Work to resolve the situation and ensure safe and sounds operations remain top priority, with internal and external experts on duty continuously to ensure that all possible efforts are being made. 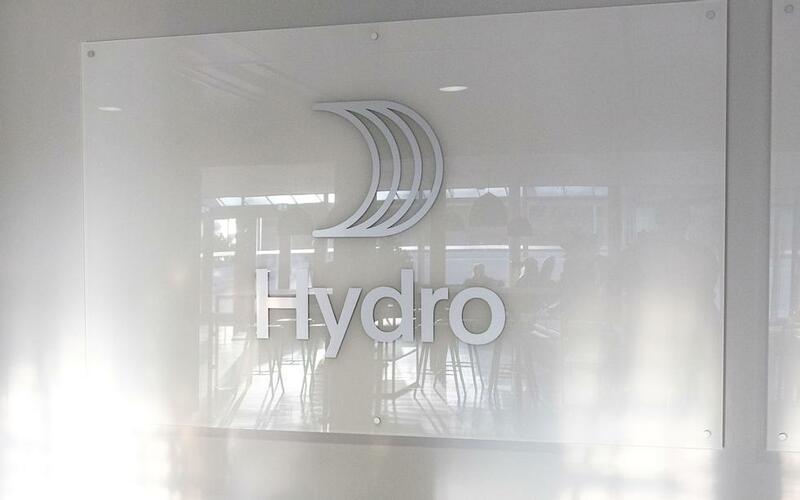 Hydro would like to invite for a general update on the cyber-attack at its corporate headquarters at Drammensveien 260, Oslo, at 14:00 CET today, March 20. Following the extensive cyber attack earlier this week, Hydro has made further progress in securing safe and stable operations across the company. .With a systematic approach our experts are step by step restoring business critical IT based functions to ensure stable production, serve our customers and limit financial impact, while always safeguarding our employee.s safety,. says CFO Eivind Kallevik. The root cause of the problems has been detected, a cure has been identified, and together with external partners, including national security authorities, Hydro.s experts are working on reverting virus infected systems back to a pre-infected state. .Experts from Microsoft and other IT security partners have flown in to aid Hydro in taking all necessary actions in a systematic way to get business critical systems back in normal operation,. says Jo De Vliegher, Head of Information Systems. There have been no reported safety incidents as a result of the cyber attack, and most operations are running, ensuring deliveries to customers according to specification, with some more manual operations than normal. The attack has been reported to Norway.s National Investigation Service (Kripos) and the police have opened an investigation. Although progressing from day to day, it is still not clear how long it might take restore stable IT operations. Rolled Products: Production running mostly as normal, with only a few exceptions. Extruded Solutions: Extruded Solutions is currently running at approximately 50 percent of normal capacity. Progress has been made, with restart of some plants as well as utilizing stock to keep delivering to customers. Extruded Solutions is working hard to enable further restarts during the coming days, which would allow for continued deliveries to customers. Hydro har allokert alle tilgjengelige interne og eksterne ressurser for å gjøre ytterligere fremskritt for å sikre trygg og stabil drift i hele selskapet, etter det omfattende cyberangrepet tidligere i uken. "Vi fortsetter å gjøre fremskritt mot en løsning, men situasjonen er fortsatt alvorlig, og vi er fortsatt avhengige av ekstraordinære tiltak for å drifte mange av våre verk. Dette er spesielt utfordrende innen forretningsområdet Extruded Solutions, hvor implementering av midlertidige løsninger er både utfordrende og tidkrevende, sier finansdirektør Eivind Kallevik. Årsaken til problemene er oppdaget, og det har blitt identifisert en kur som gjør at Hydros eksperter kan jobbe med å bringe virusinfiserte systemer tilbake til normal drift. Hydro samarbeider med relevante myndigheter, inkludert Kripos og Nasjonal sikkerhetsmyndighet. Hydro har rapportert angrepet til politiet. "Virusangrepet gjør at mange av Hydros IT-systemer ble slått av, ikke fordi de var infisert, men for å hindre at det sprer seg videre. Selv om situasjonen utvikler seg fra dag til dag, er det uklart hvor lenge det vil ta å gjenopprette stabile IT-operasjoner. Vi må kurere de infiserte delene av nettverket vårt før vi gjenoppretter de upåvirkede delene, sier leder av Information Systems Jo De Vliegher. Hydro arbeider også for å sikre at IT-baserte støttesystemer er i drift, for eksempel systemer for lønn og rapportering, med midlertidige løsninger etablert der det er nødvendig og mulig. Det har ikke vært rapportert om sikkerhetshendelser som følge av cyberangrepet. Extruded Solutions: Extruded Solutions produserer for tiden på omtrent 50 prosent av normal kapasitet, på samme nivå som i går. Extruded Solutions fokuserer alle tilgjengelige ressurser mot å muliggjøre ytterligere oppstarter i løpet av de kommende dagene for å tillate fortsatt leveranser til kunder. Hydro.s global IT organization is working continuously to resolve the situation together with external expertise. The company has now entered the recovery phase following the attack, gradually restoring IT systems in a safe and secure manner to ensure progress toward normal business while limiting the impact for people, operations, customers, suppliers and other partners. Hydro has reported the sophisticated cyber attack to Norway.s National Investigation Service (Kripos) and is cooperating with relevant authorities, including the Norwegian National Security Authority (NSM). Alunorte signed agreement with Ministério Público on third-party verification of technical reports, amendment of TAC agreed and Federal Court schedules hearing. Og i morgen blir det en fin oppgang. Hydro has made further progress toward returning operations back normal. Four out of five business areas are running production at normal capacity, but with manual workarounds. In the most affected business area, Extruded Solutions, production is now gradually ramping up in all business units. .Since yesterday, we have been able to start production again in Building Systems. It is still unclear how long it will take before we are fully back to normal, but we will gradually ramp up deliveries to Building Systems customers over the coming days,. says Executive Vice President of Extruded Solutions, Egil Hogna. As of Wednesday morning, Building Systems units were on average producing at around 20 percent capacity, while the total production output in Extruded Solutions was around 70-80 percent. According to Chief Financial Officer Eivind Kallevik, Hydro.s global IT organization is working continuously to resolve the situation together with top external expertise. .The most important thing for us now, is that we restart operations in a safe and secure manner, gradually progressing towards normal business. We are doing our utmost to limit any further impact on our customers, suppliers and other partners. says Kallevik. Extruded Solutions: As of Wednesday morning, Extruded Solutions is producing at an overall production rate approaching normal levels in the three business units Extrusion Europe, Extrusion North America and Precision Tubing. In the Building Systems unit operations is currently at 20 percent, with local variations from plant to plant. Based on current progress the expectation is for Building Systems to continue gradually ramping up production and shipments during the week. Norsk Hydro ASA, rated Baa2/BBB by Moody.s and S&P, has mandated BNP Paribas, Citi, ING and Nordea as Joint Lead Managers to arrange a series of fixed income investor meetings across Europe commencing on Friday 29th March 2019 with a global investor call. An inaugural EUR denominated dual-tranche, Reg S, senior unsecured bond issue with benchmark 6yr and expected EUR 300 million 10yr maturities may follow, subject to market conditions. The bonds are expected to be rated Baa2 by Moody.s. Use of proceeds from the contemplated bond issue will be general corporate purposes including refinancing of indebtedness. This announcement is directed only at persons (i) outside the United Kingdom; (ii) that have professional experience in matters relating to investments falling within Article 19(5) of the Financial Services and Markets Act 2000 (Financial Promotion) Order 2005 (the .Order. ); (iii) falling within Article 49(2)(a) to (d) (.high net worth companies, unincorporated associations etc…) of the Order or (iv) to whom this announcement may otherwise be directed without contravention of Section 21 of the Financial Services and Markets Act 2000 (all such persons together being referred to as .relevant persons.). This announcement must not be acted on or relied on by persons who are not relevant persons. Any investment or investment activity to which this announcement relates is available only to relevant persons and will be engaged in only with relevant persons. This announcement does not constitute or form a part of any offer or solicitation to purchase or subscribe for securities in the United States or in any other jurisdiction where it is unlawful to do so. The securities to which this announcement relates have not been and will not be registered under the U.S. Securities Act of 1933, as amended (the .Securities Act.) or with any securities regulatory authority of any state of the United States or other jurisdiction and may not be offered, sold, pledged or otherwise transferred in the United States or to, or for the account or benefit of, U.S. persons (as such term is defined in Regulation S under the Securities Act), except pursuant to registration or an exemption from the registration requirements of the Securities Act and in compliance with any applicable state securities laws. Hydro continues to progress towards normal operations. In four out of five business areas, production is running at normal speed, but with manual workarounds. Also Extruded Solutions, the business area hardest affected, is approaching normalized production levels. Hydro.s primary objective remains to restart operations in a safe and secure manner, gradually progressing production back to normal, and limiting any further impact on customers, suppliers and other partners. Hydro is also working to ensure IT capabilities for internal administrative processes, such as systems for payroll, treasury and reporting, some of which have been affected by the cyber attack. Extruded Solutions: Production in the three business units Extrusion Europe, Extrusion North America and Precision Tubing currently running at an average output of 80-85 percent. In the Building Systems unit operations are currently at 40-50 percent, up from 20 percent on Wednesday. There are still local variations from plant to plant. Based on current progress, the expectation is for Building Systems to continue gradually ramping up production and shipments during the week.